Most people consider amusement parks to be great fun, but when it comes to being sustainable there is usually not so much to smile about. Liseberg in Sweden will be an exception. How do you build a sustainable amusement park? Or is it even possible? Yes, says David Lindgren, sustainability manager in Ramboll pointing to Liseberg in Western Sweden. 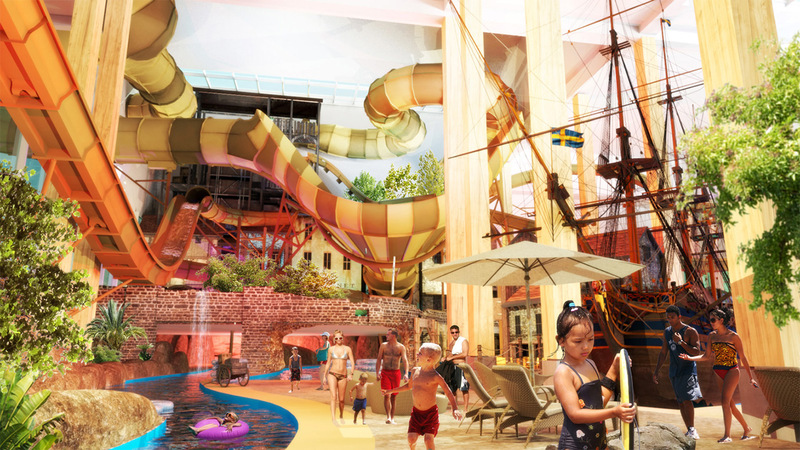 In relation to Gothenburg's 400th anniversary, Liseberg plans to expand with a water park and hotel. Ramboll is involved in all stages of the project and is responsible for the overall sustainability program and BREEAM certification. "We will help build two technologically advanced buildings with low environmental impact in a complex and dense urban environment, making the neighborhood more vibrant and attractive, says David Lindgren. More concrete examples on the sustainability cases within the projects are environmental sustainability with focus on e.g. low carbon impact through low energy design in building envelope and installations. Furthermore, we are implementing low carbon energy sources and encouraging to fossil free transport to and from the destination such as public transport, biking and green vehicles. An immediate add-on from the beginning was to have an ecologist linked to the project aimed to improve the biodiversity and the ecosystem services, by for example using plant species that can attract insects and birds to the area in order to make the nature flourish. Environmental impact from choice of building materials will be reduced by implementing a Life Cycle Analysis methodology and phase out of building products with hazardous substances. Measures for reduction and increased reuse of building waste at the building site will be taken as well. Furthermore, focus has been on the social sustainability. The project improves liveability by addressing equality by working on safety and security for women, diversity with inviting spaces for children and visitors from all nationalities as well as accessibility for all when designing public indoor and outdoor areas and attractions. Liseberg works with a broad vision of sustainability in the project. There’s a strong social dimension, where the focus is on creating a facility that’s inviting and accessible to all. The environmental and health issues are predominantly managed in the framework of a BREEAM certification of the buildings. The project is planned for completion between 2021 and 2023. The hotel plans to have 450 themed family rooms, while the indoor water park will contain adventure pools and water attractions such as relaxation areas and restaurants. Both facilities will be open all year round. Ramboll’s assignment includes strategic sustainability management support to the developer. This mean that Ramboll develop and supervise the implementation of the Sustainability Program for the whole project. Ramboll has also been appointed the BREEAM Assessor role as both the hotel and waterpark will be certified towards BREEAM-SE at a Very Good or Excellent level. David Lindgren will be responsible for the BREEAM assessment, which means giving overall strategic support and reviewing that the buildings meet BREEAM's criteria.